Rising sea levels are affecting the Nile River delta, the triangle where the Nile spreads out and drains into the sea. It's where Egypt grows most of its crops. According to the World Bank, Egypt — with its already high poverty rates and rapidly growing population — is one of the countries that will be most vulnerable to the effects of climate change. Hazem Adel is already seeing some of those changes firsthand. He sells hats and woven handbags at a stall in front of a wall of concrete barriers on the Alexandria waterfront. "The water used to flood and cover the people and their cars," says Adel. "That's why the government put up the barriers – to stop the high water so it won't flood the street." All along the waterfront, the government has erected barriers to counter increasingly fierce winter storms. There's no beach on this part of the shore. The sand washed away years ago. Many scientists predict a sea level rise here of more than two feet by the end of the century. Some historic buildings are already crumbling, as salt water seeps into the bricks. Entire neighborhoods could be submerged. 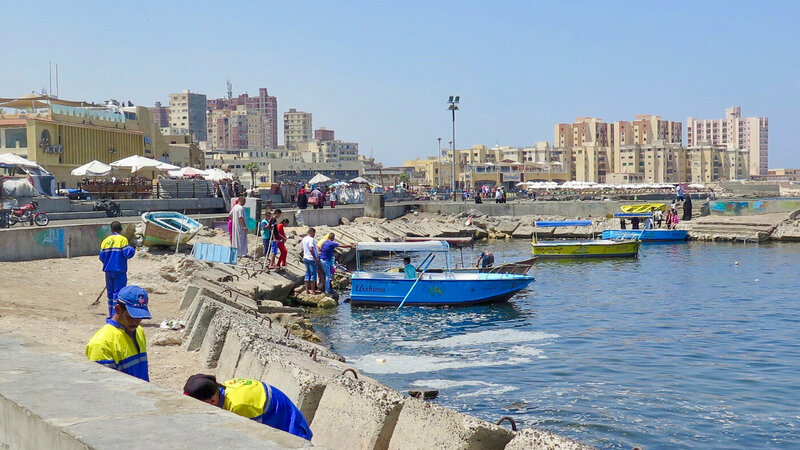 For thousands of years, Alexandria's fortunes have risen and fallen with the sea. Near the concrete boardwalk, guides lead Arab tourists through a fortress built partly on the ruins of one of the wonders of the ancient world – the lighthouse of Alexandria. For almost 2,000 years, the stone lighthouse was the tallest building in the world. It used mirrors to reflect the sun, and fires at night, to warn sailors away from the rocks. After a series of earthquakes between the tenth and 14th centuries, it tumbled into the water. Over the centuries, the sea swallowed what had been a thriving port and even the outline of the harbor itself. Fishermen stand on what are believed to be some of the remains of the base of the lighthouse, casting lines into the water from long poles. 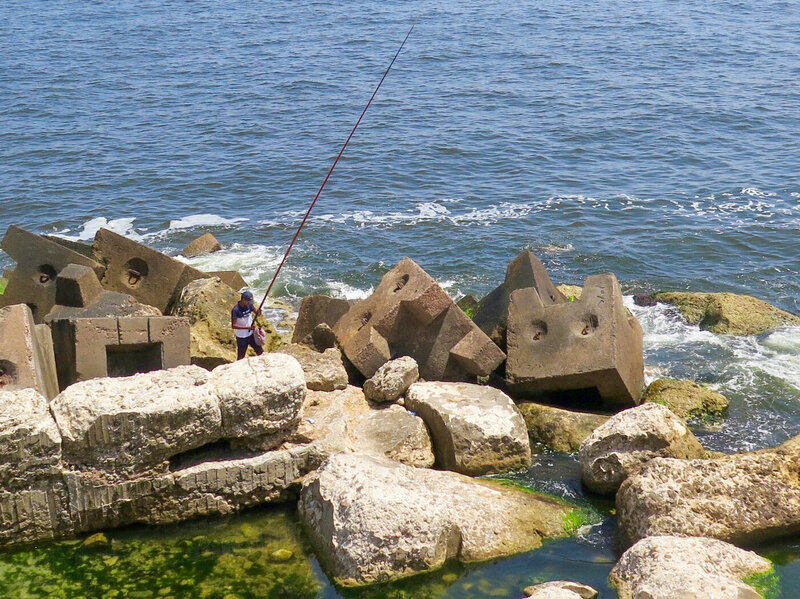 Saleh Hilmi, who has been fishing here for 25 years, says the fish now are smaller than before – he throws the ones he catches to stray cats. Because the sea water is warmer, he says, the bigger fish have retreated to cooler, deeper water. 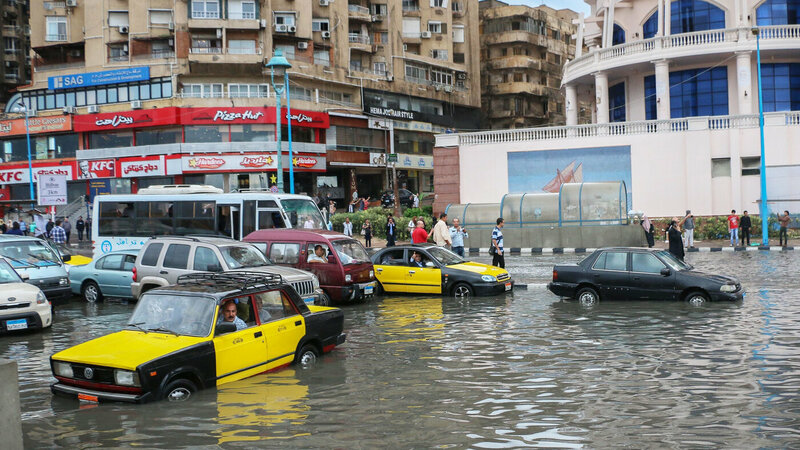 It's a big worry for climate change experts like Mohammad al-Raey from the University of Alexandria, who has been researching the potential effects of warmer temperatures and rising sea levels for decades. "The sea level rise would affect all coasts and all beaches," he says, looking out over the brilliant blue waters of the Mediterranean along Egypt's north coast. "The models show the Middle East would increase in temperature and decrease in precipitation." Most models predict a possible average mean temperature rise of more than three degrees Fahrenheit over parts of Egypt over the next four decades. Raey says the effects of hotter weather, including reduced rainfall, would cut agricultural productivity by 15 to 20 percent – a huge blow to a country already struggling to feed its people. More than half of Egypt's crops are grown along the Nile delta. All along the delta, the river banks are eroding. With rising sea levels, sea water is seeping into Nile water used for irrigation. "The crops die," says Youssef Ghazali, who has been farming for 50 years. "If you water them with salty water, they die immediately. If I had proper water, I could grow rice, clover cotton. I could grow anything." Ghazali's arms are crisscrossed with red gashes from cutting thistles. He shows me a patch of bare earth where, two years ago, he was growing rice. Now he says it's too salty to grow anything at all. Other farmers say they have had to abandon traditional crops like sugarcane because of the salinity of the water. Ghazali says people here are already struggling with river water polluted by runoff from factories — and now they've been told that human activity is changing the very weather. "We've heard for a long time that we shouldn't burn wood and straw," he says. "They say because of the smoke from that and smoke from the cars, it affects the temperature." Other Egyptians aren't so sure. Further up the Nile delta, near a fishing village called al-Ma'adiya where the Nile meets the Mediterranean, fisherman say winter storms have been so fierce the past two years, some people here believe God is punishing them. "Last winter was the worst," says Bedair Mohammad. "The sea swallowed up some of the land and got closer and closer to the village. We're seeing things we never saw before, in a way that could make us believe this is anger from God on the village and its people." Mohammad says every year the winds get stronger, the waves get higher and more land disappears. They have to go further and further out to sea to find the same fish they used to catch close to shore. He points to where the pale blue water of the Mediterranean starts to turn brown a few hundred feet closer to shore. It was bare ground just a few years ago – now it's covered in water. In his grandfather's time, it took more than half an hour to walk from the village to the shore. Now it takes less than 10 minutes. Ten years ago, these were such rich fishing grounds people referred to this stretch of the coast as "Kuwait" — because its villages were so prosperous. Now the fish near the shore are smaller and scarcer. Fishermen need motorboats to get out to deeper water instead of the rowboats they used to use. Mohammad says last year, the winds were so strong, the third story of his house was knocked down. Boats were tossed up from the water into the road. "In the winter, the sea attacks us," he says. "We are afraid the village will sink into the sea."